Now with the breeding stock sales nearly completed, breeders are in the process of finalizing their breeding decisions for the 2012 season. We've seen a big increase in the number of TrueNicks reports run in the past 30 days—102,551 to be exact, compared to 71,422 during the previous 30 days. Always popular during the breeding season is our Broodmare Analysis Report, which allows you to choose any 50 stallions and get hypothetical pedigrees, TrueNicks ratings, variant scores, and the broodmare sire improvement index for each mating. But one thing we kept hearing from customers was that they wanted all the top nicks, and only the top nicks. They didn't want to miss any stallion they might have forgotten if he had a high nick rating with their mare. This was the inspiration for a new report, the Broodmare Select. Broodmare Select allows you to enter your desired stud fee and location criteria, and the report will consider all the stallions fitting your profile. Instead of a max of 50 stallions, you can cast a much larger net and get only the stallions that nick B+ or better (A++, A+, A, B+) with your mare. Take for example the Tactical Cat mare Erhu (I chose her because I worked with her at a training center when she was a racehorse). 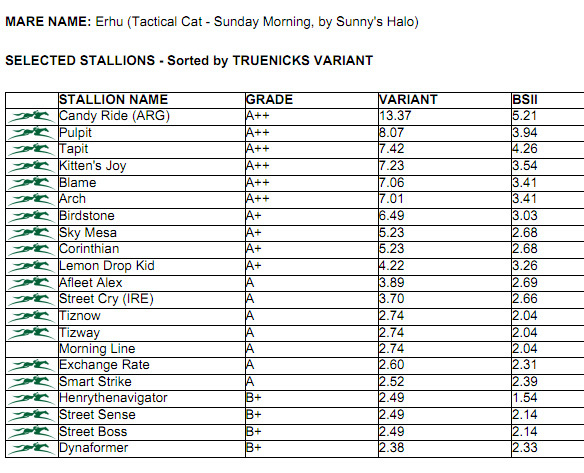 In this example, I searched for Kentucky stallions priced $20,000 and up. I also added in new 2012 stallions individually, such as Morning Line (TrueNicks) and Tizway (TrueNicks), so they would be considered in the search. The result is a quick shortlist of her best nicking options (see the chart below). The report then lists each hypothetical five generation pedigree and the top five runners on each cross in similar format to Broodmare Analysis. Breeders can then compare this list with their own notes on the stallion's physical and aptitude characteristics, and take into account any trends in the mare's family produce history (a complete Equineline catalog style pedigree is included in the report). You can view the full report and read more about Broodmare Select with the links below, or of course, fire some questions away on the blog.